So, I’m going to do something kind of unusual for me here. I’m not going to say much right now in this intro to today’s post. Rachel and Jeremy do such a great job of talking about the genesis of and creation of this book that for me to go on about it—try to summarize it, that is—would be redundant. I’m grateful that they’re so forthcoming with their thoughts below. Indeed. So, let’s get right to it … I thank Rachel and Jeremy for sharing. 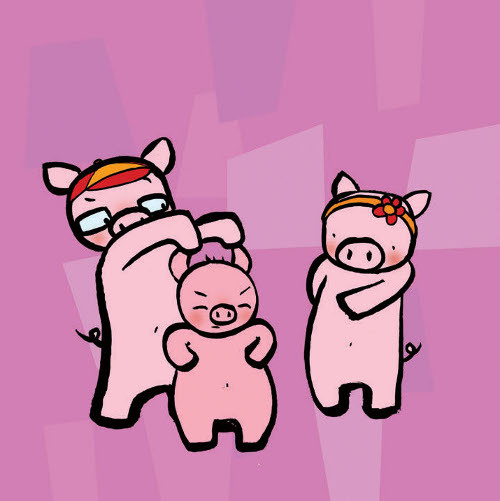 Jeremy: Piggy Bunny is a special book for me. It’s my first book with an author other than myself. And what a great “first-book-with-another-author”! I hadn’t intended it this way, though. I had every intention of writing it myself. But, as fate would have it, it didn’t work out that way. I became a writer by accident. I entered the kid-lit “industry” as an extension of my illustration career, thinking that I might draw a couple of books and have some fun. However, a couple of editors suggested I try writing. I was skeptical. But to my continued amazement I LOVED writing. Almost as much as I liked drawing. So with three books under my belt (Grumpy Bird, Me Hungry!, and Boo Hoo Bird) and a great deal of confidence and enthusiasm, I launched myself into a HUGE new project (about which details will remain slim at the moment, as I’m still not finished and don’t really know what sort of monster I’m creating). The end result? Three years of writing and re-writing. I learned a lot. 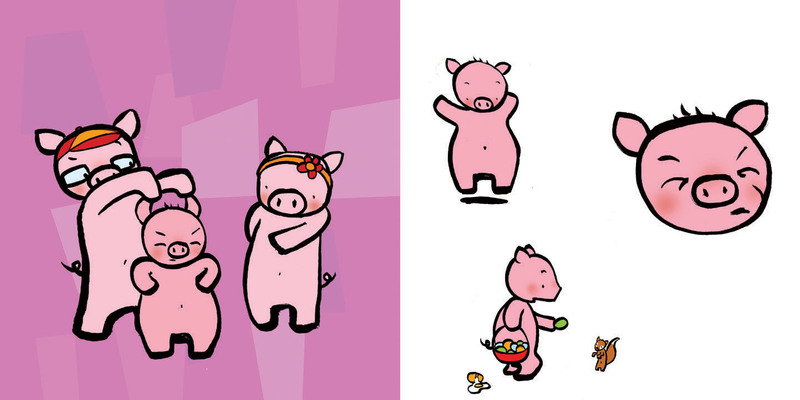 My portfolio has, for many years, featured a drawing of a pig wearing a bunny suit. The drawing is funny (in a quirky kind of way), and the pig-in-the-bunny-suit looks a bit embarrassed and self-conscious — a real character. I have always liked the drawing, and it hinted at a story. Then Jean Feiwel (of Feiwel and Friends) came across this image, while visiting with my agents, and stopped in her tracks and said (I’m paraphrasing, I wasn’t at this meeting), “I want this pig! Is there a story here?” There wasn’t, but I took this as an opportunity to write the story. 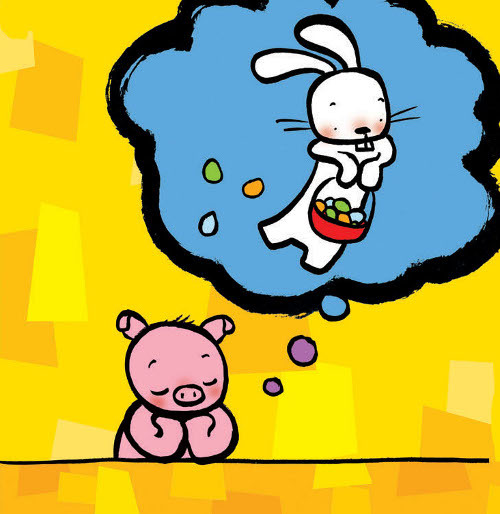 In fact, I wrote at least half a dozen picture books featuring a bunny and his piggy friend who wishes to be just like him. None of my books really gelled, though. They were cute(ish) but didn’t quite hit the right mark. Finally, out of sheer frustration, I suggested that we talk with Jean about this book and see if she had a writer in mind. I liked the character a lot but, for some reason, didn’t feel that I had to be the one who wrote the book about him. Besides, the collaborative nature of making children’s books is one of my favorite things about them. I was ready to take the next step and explore a more collaborative approach. Jean suggested Rachel Vail. I said “okay” and put my faith and trust in them. And the rest is history. So, Jean showed Rachel my drawing, and Rachel had the same reaction to it as Jean had (but Rachel can tell you about that). And so Rachel started writing me a book. The funny thing is that she “got it” in a way that I never could. 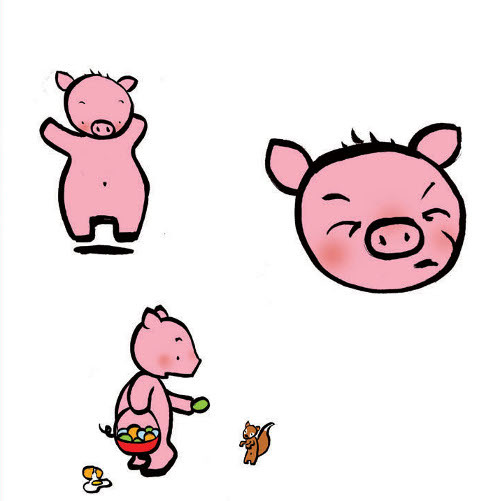 My stories were very “ugly duckling”-inspired — the pig realizes he’s a pig and accepts who he is. And so the bunny suit must be removed at the end. And that’s why my stories didn’t work. 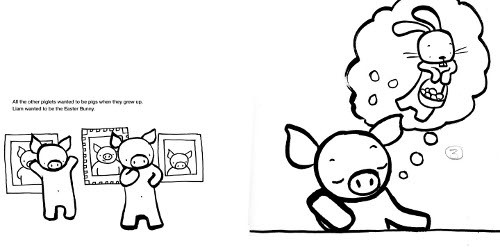 Rachel, on the other hand, saw what I couldn’t see: the pig didn’t have to accept others’ ideas about his identity — others had to accept his identity of himself. Brilliant! So the bunny suit doesn’t have to be removed. I was in awe. And the book presents a much stronger “message” (hate that word), if you wish to read between the lines. It’s subversive in the most beautiful way. And I was suddenly in love with—and in awe of—Rachel’s writing skills. So, this is what a real writer can do. I’ve still got a lot to learn. But what better way to learn than by working with such extraordinary talent. She took this drawing of mine and really made it hers. She found the character lurking beneath my heavy black lines, where I couldn’t fully see him myself. In keeping with picture book tradition, I didn’t get in touch with Rachel before the book was finished — for no good reason except that I wished to focus my attention on drawing and hopefully surprise her with something amazing when it was finished. I can’t speak for Rachel but, despite the usual headaches of making picture book art, the book came together beautifully and was a magical experience. So, when Rachel was finally presented with a PDF of the book, all I could hope was that she would be as excited about it as I was. And I think she was (is). What a relief! I wanted my art to do justice to her words. 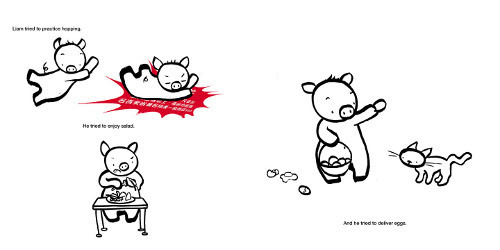 Picture books are funny that way. They can be the most inspiring collaborations when they are complete — from author to editor to illustrator to art director and designer to marketing and publicity, each brings a piece of their own heart to the table and we sew them all together to create something bigger and better. (Sorry, I read Frankenstein recently so that’s the best/silliest analogy I can think of — ha!). As for the drawing process: that’s perhaps the most difficult part to discuss, as I never know where to start and I have tried something different with every book I’ve done. With Piggy Bunny I completed three dummies before going to final art. In some ways, the book changed very little from the earliest dummy to the final one. I did my first one digitally, drawing the whole thing in Adobe Photoshop — something I’ve never done before and will likely never do again. While I like some of these drawings, they didn’t help us see what the final book would look like. They helped with pacing and storytelling, though, so it wasn’t wasted time. The biggest changes after this round came in the form of re-designing all the characters: smaller snouts, no clothes, and some other changes here and there. For the second dummy, I chose to draw everything with a brush, my preferred medium. At least it would make it easier for us to read where things were (or weren’t) working. We were also on a tighter deadline by this point, so using a brush would mean less work when final art began — namely, if we all liked it, I wouldn’t have to re-draw again. I could just take the “rough” drawing and color it. 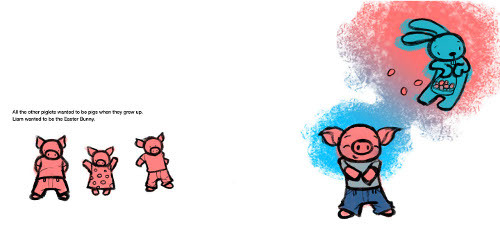 “All the other piglets wanted to be pigs when they grew up. I prefer working with brush and minimal pencil sketching beforehand. I love the spontaneity of brush drawing and all the mistakes that invariably occur that can’t be fixed. The brush forces the artist to accept mistakes and to see the strengths in them. In fact my whole “style” is built on those mistakes. 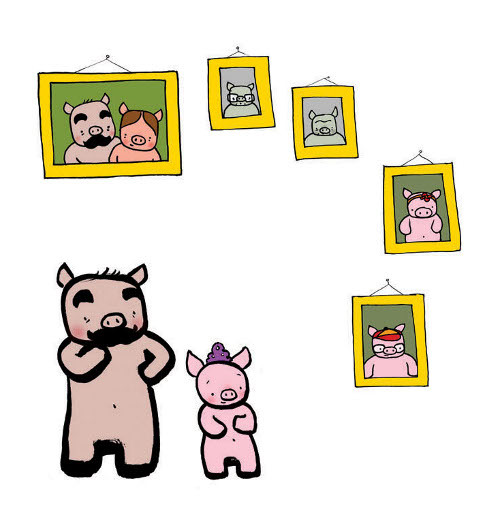 The hardest part about creating the final art in Piggy Bunny, for me anyway, was foregoing so much of my preferred Photoshop collage and digital painting. I like my coloring to be organic and loose (like my drawings). But, since this whole book began life as a single illustration, my art director and editor decided that the best approach would be to stick with the simple palette and design of the original piece. I was skeptical. However, I gave it a try, and the end result is quite a lot stronger than I’d thought it would be. In fact, I can’t imagine ever having considered doing anything different. I love it when that happens! So, when the drawings were approved, I laid-in some flat colors and built a bunch of geometric “wallpapers” to use in the backgrounds. 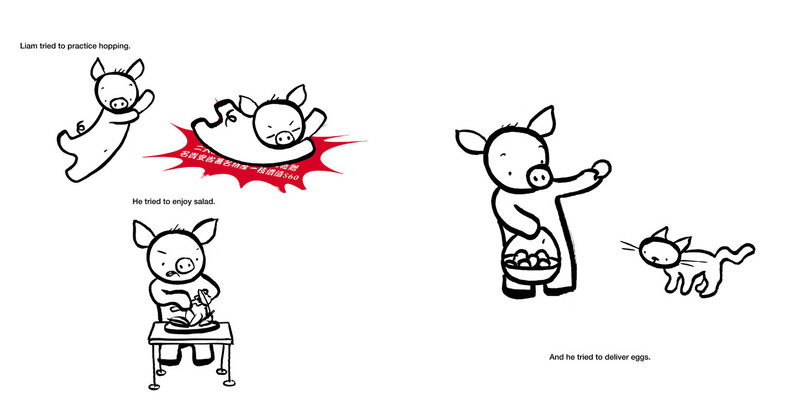 But, because of the minimal backgrounds and the strong text, I really had to get our characters to ACT on the page. This book, more than anything else I’ve ever illustrated, was much like actors on a stage putting on a play — if they were doing their job properly, then I could let their actions fill in for the sparse or nonexistent backgrounds. It was a real challenge. And a very rewarding one. I’m tremendously proud of this book. Rachel: I fell in love at first sight. My editor/publisher, Jean Feiwel of Feiwel & Friends, asked if she could send me a picture she’d had in her office for a while to see if I had any thoughts for a possible picture book. I explained that I was pretty booked up, so to speak, with currently-due novels and also that I have always originated any picture books that I’ve written and probably wouldn’t be any good at writing something from a picture, even if I did have time. My younger son’s name is Liam. “Is it?” Jean asked. I still don’t know if she remembered that and knew it would get me, or if it was coincidence. I promised her I would think about whether I had a story for this sweet picture and then silently promised myself I wouldn’t let Liam, the-piglet-who-wanted-to-be-a-bunny, distract me. I kept only the first promise. 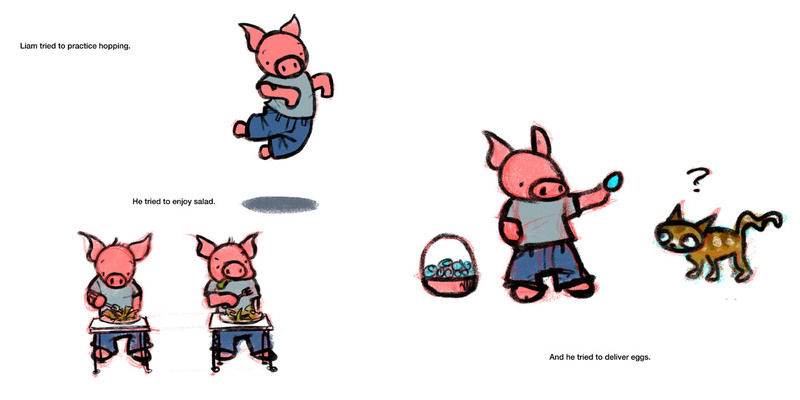 I asked my son Liam if he would want his name used for a pig in a picture book. He said YES. So Liam he stayed and, alas, in my mind he also stayed. I kept flipping to that picture on my computer, the one Jean sent which is now, almost exactly, the cover of the book, and it still gets me: those simple lines convey such a complex mix of emotions: hope, sincerity, worry, determination. So much captured there. But what was the story? 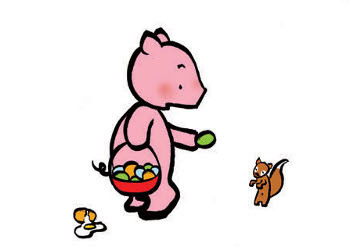 Jean had set up the thrust: This piglet wants to be the Easter Bunny. Pretty obvious what the plot would be from that clear motivation: the piggy would have to try acting like/pretending to be a bunny—maybe he’d wear his bunny costume and have some antics—and it would all be fun until, of course, he’d eventually have to take off the bunny costume and appreciate himself as he is. Well, I told myself, it would be fun up until then. I couldn’t get myself to stop thinking about it — or to write it. 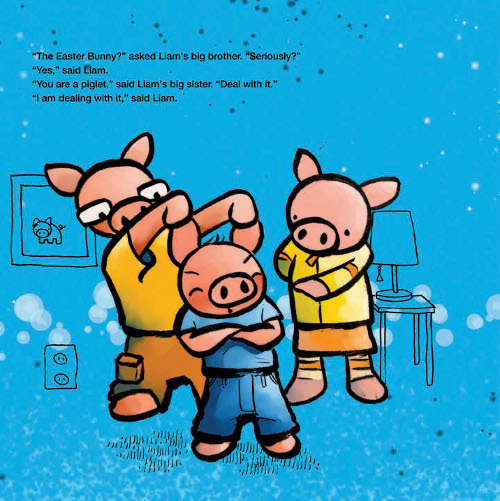 “‘The Easter Bunny?’ asked Liam’s big brother. ‘Seriously?’ ‘Yes,’ said Liam. Why can’t I just write this thing? Well, for one thing, I am so sick of books that tell kids they should embrace who they are. Why? Isn’t that what a good kid-book SHOULD tell a kid? What kind of awful curmudgeon am I? Why do they even let me write books for kids if I don’t want to tell kids YOU ARE GREAT AS YOU ARE? But what does that really tell a kid? Does a kid sometimes hear that as a limit instead of an affirmation? YOU ARE GREAT AS YOU ARE. (Because let’s face it, kid, no matter how much you try, you’re nothing more than that?) Even if it’s true (which of course it’s not, not necessarily), is that really what kids should be told? How deflating! YOU ARE WHO YOU ARE AND THAT’S ALL? Should the message we send to kids really be COMPLACENCY? When my father’s childhood piano teacher told him he would NEVER play at Carnegie Hall and my father-in-law’s chorus teacher told him to mouth the words because he couldn’t sing, both boys took the message to heart, accepted it as TRUTH. As men, they still deny that it stung. But isn’t it important to believe you could play at Carnegie Hall some day, while you plunk out your scales, if that’s your dream? Or sing out loud and proud at the Met or in the third row of the damned school chorus concert? I have never heard my father-in-law sing a lullaby to his grandchild — or “Happy Birthday.” How is that GOOD? Should a kid at least have the right to be a prima ballerina or artist/veterinarian/superhero/ninja/center fielder for the Yankees in the space of his or her imagination without some cloddish adult stomping on the fantasy? And what about all those kids who know that deep inside they are somebody beyond who their appearance announces to the world they are? And also –- is it even TRUE that YOU ARE WHO YOU ARE? How about YOU ARE WHO YOU IMAGINE YOU ARE? Isn’t that the magic of face paint, a mask, a magic wand, a costume, a hat? Or that maybe-it’ll-be-transformational new haircut or diet? Kids are bad guys and cookie monsters and clowns, sometimes in the space of a minute. Maybe we grown-ups, who think we are being so supportive with all our “just the way you are” are forgetting to listen to the kid’s need to be who he isn’t, right then, or doesn’t seem, in our limited imaginations, to be -– but IS, on a deeper level? 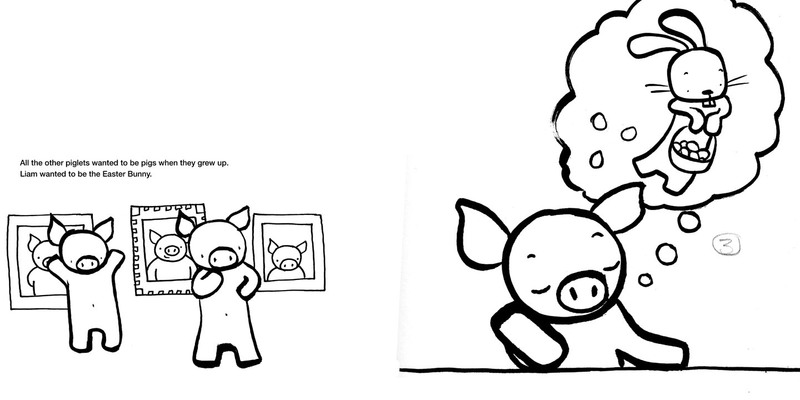 What if Liam the piglet SUCCEEDS? What if, at the climax of the book, he doesn’t take off the bunny costume and accept his limited lot in the mud, but instead gets to PUT ON his costume and live his dream? What if he does get to be the Easter Bunny? 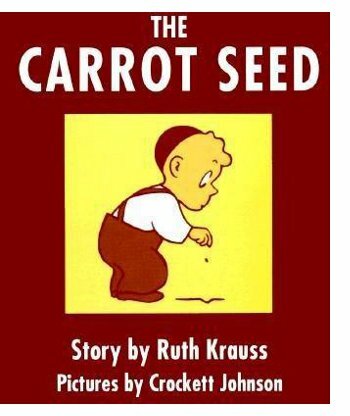 I suddenly remembered The Carrot Seed (by Ruth Krauss, illustrated by Crockett Johnson) and the perfect thrill I got, reading it again and again as a kid and then as a parent. It wasn’t a modern, ironic victory the little boy achieves –- winning by letting go of an outgrown ambition. It was pure unalloyed YES. The kid thought he could grow a carrot and, despite the very reasonable nay-saying all around him, he worked at growing his carrot and believed he could do it -– AND HE DID. 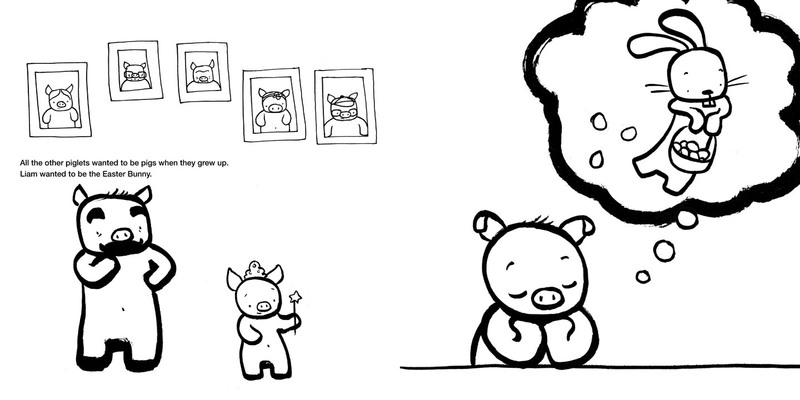 When I saw Jeremy’s delightful artwork, after the writing was done, I was completely thrilled. How he captures so much heart in those thick lines astounds me. The whole team at Feiwel & Friends did such a brilliant job bringing the book to life — with the mix of matte and glossy art, the activity guide, the loving shepherding it is getting from idea to kids’ hands… all the “Friends” at Feiwel & Friends are so committed and so creative. I remain honored that Jean and Jeremy trusted me with Liam’s story. This may be the most subversive book I have ever written. The earnest ones are always tricky that way, I guess. 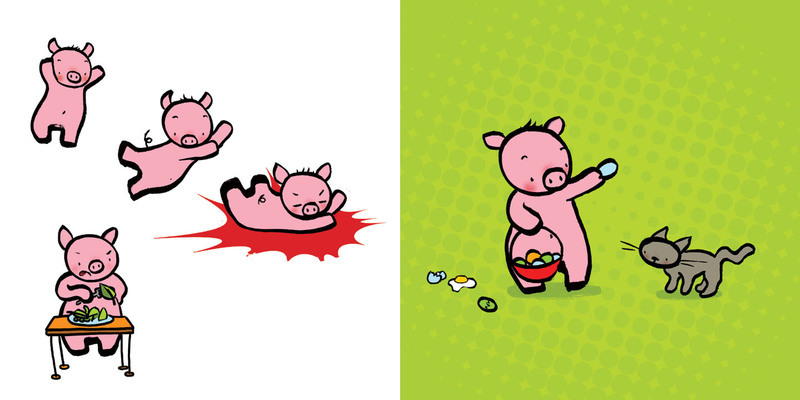 PIGGY BUNNY. Copyright © 2012 by Rachel Vail. Illustrations copyright © 2012 by Jeremy Tankard. Published by Feiwel and Friends, New York. All images (with the exception of The Carrot Seed cover) used with permission of Jeremy Tankard. 1) How Rachel and Jeremy were so generous in sharing their thoughts on writing and illustrating today. 2) Collaborating with Jama this week. 4) “California” by Delta Spirit. Lyrically (as I already wrote in the hyper-hypo world of Facebook), it’s like a lost George Jones song. Heartbreaking, but beautiful, lyrics. All wrapped up in a great rock song. 5) This note I found that my eight-year-old had written for her friend sleeping over. What gets me is the notion of playing “libraryans.” SCORE. Also, I love the burning question about doughnuts or rolls. But the “P.S.” makes me laugh, too. 6) I’m still confounded by the marketers for the film adaptation of The Lorax (having the Lorax speak for the SUVs and such), but I went and saw it. And the kick is how hard my girls laughed at the marshmallow sequence, ’cause they love marshmallows about. that. much. The eight-year-old was damn near hyperventilating from laughing at that part. What are YOUR kicks this week? Also, which do you like better: Doughnuts or rolls? Or maybe burritos? Or maybe even setting the table and lighting the candles for that visit from happiness? I love Piper. I’m going to buy a share and own .000000001% of her élan, okay? I love that she scored on burritos, and that there IS a question between doughnuts and rolls. That’s hysterical – sugary carb, or buttery carb: You make the call! and that there are books which tell you that all you’ve got to do is put on the trappings of someone else, and for how ever long you’d like to be, you can be someone utterly different. Since, this week, I am SO over me, I am going to put on my darned bunny suit and see if anyone wants an egg. 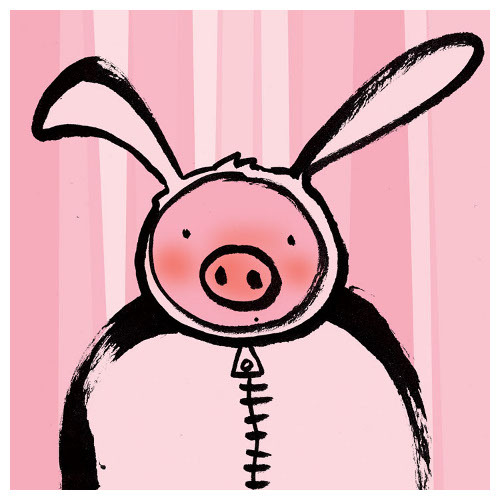 Pig in a bunny suit! My life is complete. Adorable. Thanks to Jeremy and Rachel for sharing the backstories of making this book. I cannot tell you how much I love Liam’s father’s mustache :). My biggest kick was of course co-interviewing Maira with the one and only Jules, which required serious consumption of cake and Cheez Doodles. Getting ready for another Poetry Potluck at Alphabet Soup. Especially love the cherished family recipes and photos. Just finished reading Helen Frost’s Hidden. OMG. So beautifully crafted and compelling. Could not put it down. Encouraging news about my Dad’s health. He will be 98 this Fall. A gentle rain to wash the pollen away. Borrowing every Mary Oliver book in my library and feeling so uplifted and spiritually nourished by her poetry. And Tanita and Jama- I guess this is what makes the world go round cause it’s donoughts all the way for me! 1. I have to be a bit of a copy cat cause Jules and Jama’s interview this week was one of my favorites. The topic of course was part of it but also the fact that you collaborated so beautifully on a shared dream- the best! 3. Shine. Now need to read Chime. 4. Seeing huge progress with a reading client. 5. The fluffiness of our puppy. 7. Movie night with my youngest while my oldest was at a sleepover… popcorn, twizzlers and snuggling! Tanita: HA. Like her mama, yes, she is all about carbs. Let us know how the bunny suit goes. Jama, nope, not rhetorical, but we can pretend it is. Looking forward, as always, to your April posts. Thanks for the book rec, and GO, JAMA’S DAD. Stacey, I love kick #7. I told the girls I’d let each one of them skip school one day for us to hang out. Each girl would get one day. Since then, they have asked me NEARLY EVERY DAY when this will be. …. And of course you’re seeing progress with a reading client, ’cause you are so good at what you do. And I reeeeeally wanna read Chime already. 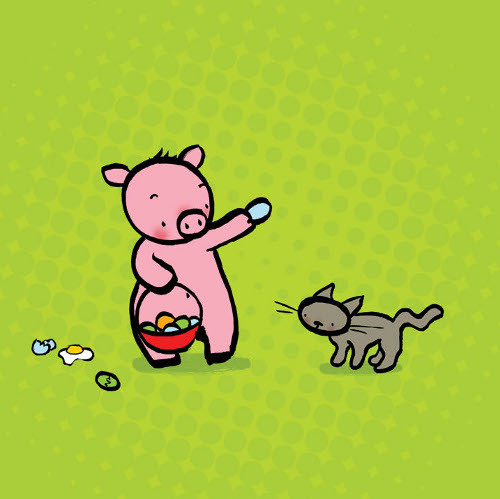 Oh thank you Rachel and Jeremy, I love Piggy Bunny. 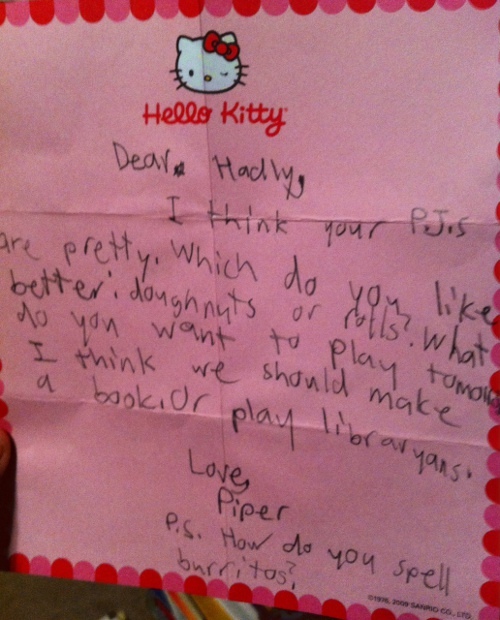 Jules, Piper can be my libraryan. I love it! 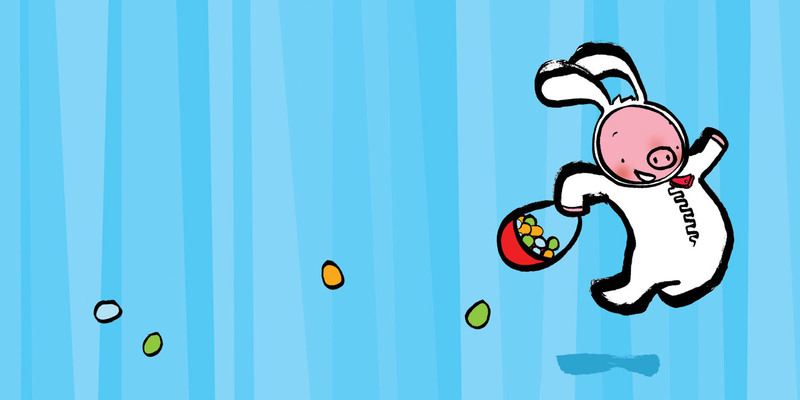 And how fun to collab w/ Jama. Tanita, pic of you as a bunny! Jama, can’t wait to see who you have for Poetry month. Stacey, will have to check out Shime. 2. Poetry workshop w/ Paulann Petersen yesterday. Fabulous. Posted on Deowriter. 3. Twenty-four slices written for Slice of Life Story Challenge with Two Writing Teachers. 4. Two hour late start because of snow BUT I didn’t know until I got to school. (so driving wasn’t an issue). 5. My first food cart experience in Portland yesterday. Yum. 6. Book club tonight. Discussing The Girl w/ No Shado. 7. Fabulous webinar with Mike Eisenberg, teacher librarian guru. Piper’s note is hilarious. PIggy dreams of being a bunny and I dream of being a librarian. I joined Goodreads and that makes me feel a little bit like a libraryan whichi is also nice. Those were kicks one and two. 3. My Mntessori course this weekend…the subject was language. We wrote stories, danced and wrote in sand outside in the sun. I was one of a handful of foriegners in the group which was amusing. 4.Riding my bike to “school”. I love that I don’t have to drive here in Berlin. It’s easy to get around. 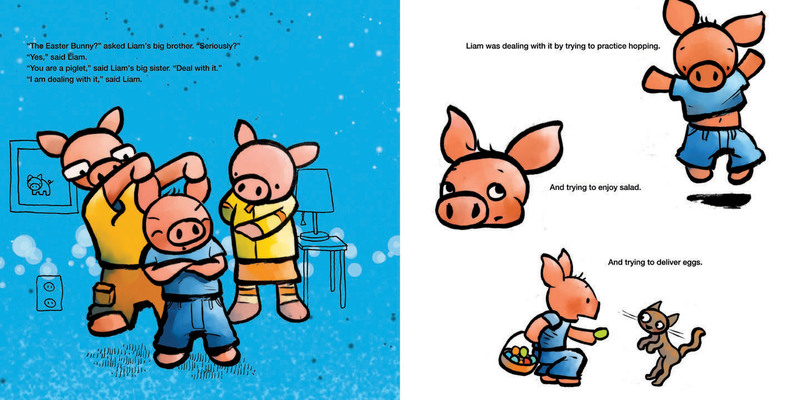 Liam the Easter (piggy) Bunny – love this book! 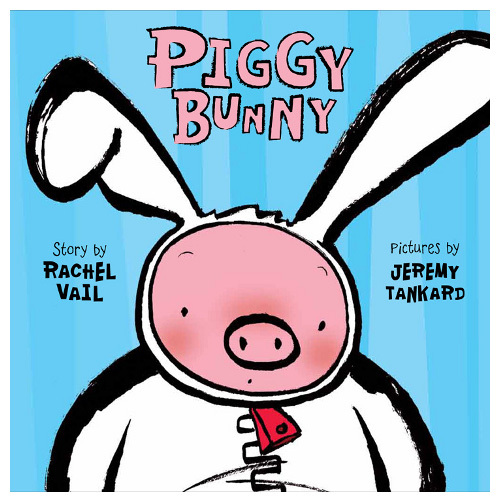 And really loved reading how it came together especially Rachel’s writings on how come he can’t keep the bunny suit on. Thanks guys for sharing the whole process with us! Jules – loved your collaboration with Jama on the Maira Kalman interview. I gave “Why We Broke Up” as a birthday present to a special 16 year old this month, and it was a huge hit. Tanita – hope its a comfortable bunny suit. Jama – your kick about borrowing every Mary Oliver poetry book made me imagine you sitting on a comfortable rug, surrounded by open books everywhere, and smiling. Great kick. Stacey – Hooray for the fluffy puppy and movie night! Jone – that snow was certainly unexpected, and then Friday and Saturday’s sunshine was wonderful. I am eagerly awaiting my poetry postcard! 1) Three day jury trial last week. Finished on Thursday, verdict an hour and a half later, good result. 2) Sunshine for Friday’s Furlough Day. 3) Thrift shopping with a girlfriend all day Friday, and lunch at http://www.steakadelphia.com/ I had the Supreme. It. was. amazing. 4) Cocktails and dinner later with more friends. This time http://www.pokpokpdx.com/ We ordered lots, and shared. Yum. Then I went home and fell into a food coma. 5) Read “Under the Never Sky” by Veronica Rossi, I liked it, for the most part. 6) Currently reading “The Storyteller” by Antonia Michaelis and am really sucked into it. 7) Bought and watched the movie Young Adult, with Charlize Theron. It’s twisted, and it really cracked me up. Happy Sunday and have a great week everyone! 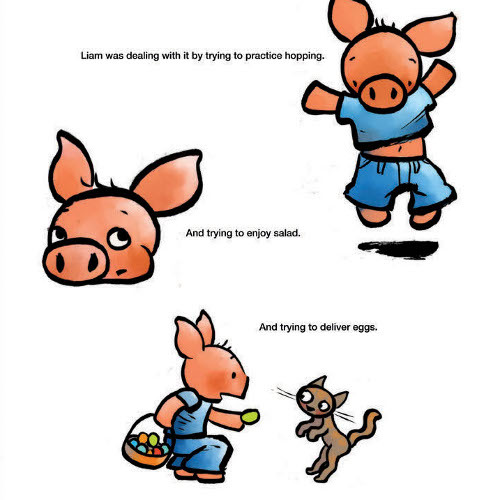 You had me at: “Hello, my name is Liam and I’ll be your Easter Bunny.” I find the backstory so interesting and helpful. The character who grabs and haunts someone. The story that blossoms with a collaborator. The question that bugs a writer… until she finds the answer by rejecting the original premise. 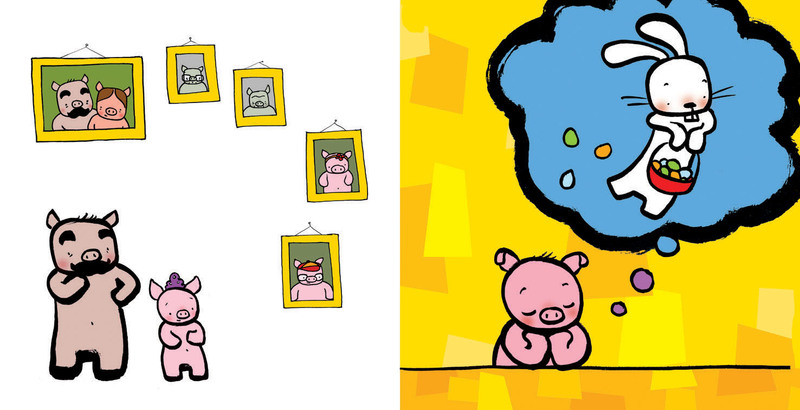 Each is such a great example of the ‘magic’ (inspiration/angst/pursuit/artistry) of picture book creation. I’m going to try and share Rachel’s “Why can’t I write this thing?” exploration. Brilliant. A bit of a fly-by today: I’m at hubby’s family reunion at a beach house in Galveston TX and I shouldn’t be antisocial too long. As always, so many kicks that make me smile: all things Maira Kalman, the sleepover note (ha! ), poetry potlucks, giving this book in an Easter Basket (great idea), Portland food carts, studying language by writing in the sand, thrift shops and food comas. And how to spell ‘burritos’; personally, I like to ponder spelling ‘quesadillas’. 3. Saw “The Hunger Games” with theater full of screaming teens on Opening Night; liked the movie and the enthusiam. Fly-by posting! 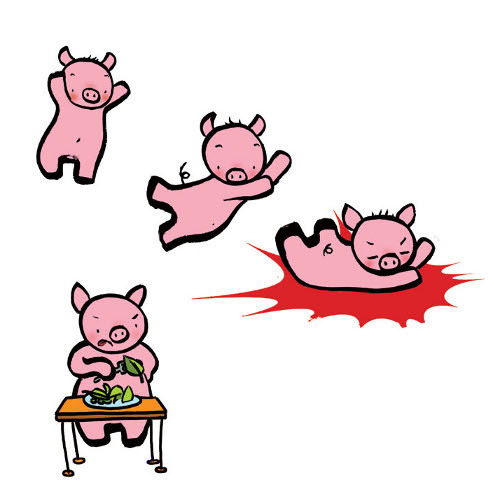 Good afternoon, Imps, pigs, bunnies, and kitties! Hope you are enjoying your weekend. Lisa, LOVE YOUR GIFT TO YOURSELF! Rachel, aw thanks. Me, you, kickball. One day. I really wanna read Why We Broke Up.I want to see Young Adult, too. I heard it’s very funny. But not exactly uplifting (which I don’t expect anyway). But funny! What a good week with friends (and good food) you had, Rachel. Hi, Denise! Your family reunion sounds fun. Thanks for taking the time to visit. Enjoy the rest of your visit and all the shells. Hi, Little Willow! What current soundtracks do you recommend? Jules, I didn’t think the snow was an issue. There was hardly any there until I got to school. Was about 2 inches. Very fun. Food was good. Here is another one I love by the Belle Brigade. 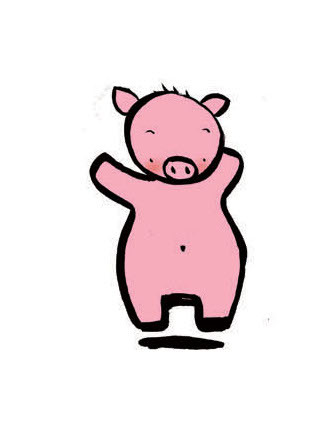 I love Piggy Bunny. Thanks for sharing. Just so good to see this in writing, first of all. And then it is really helping my thinking for my own writing. Thank you again. Also on your kicks: LOVE that quote from Maira Kalman. And your daughter’s note. I hope you can keep it for her. It is just so lovely. Jules: I was listening to the Once soundtracks – the original film soundtrack and the new Broadway version – a lot that week.